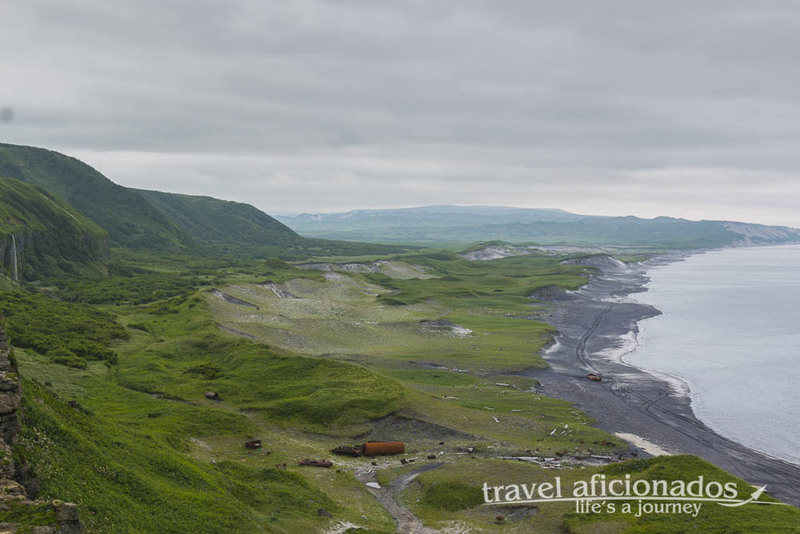 Iturup has a certain rawness that comes with being such a remote and exposed place. 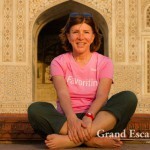 For me, simply being in such an inaccessible place was already an adventure. 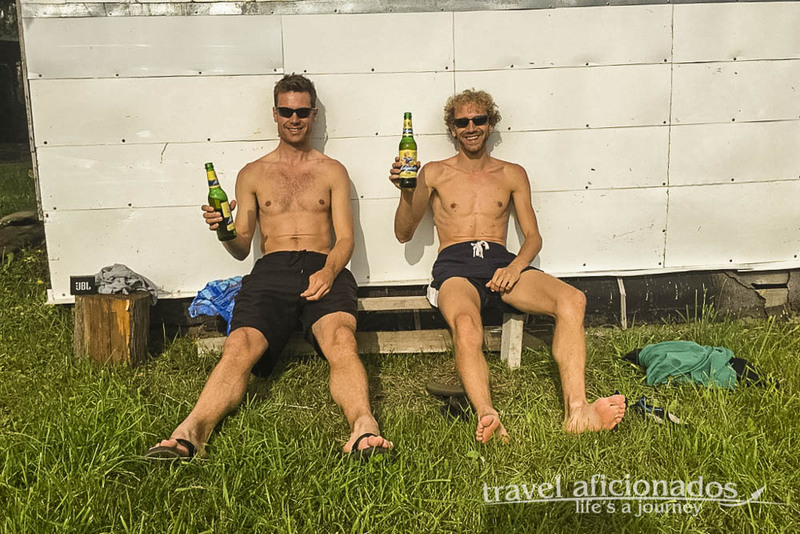 Add climbing volcanoes, walking along endless beaches and bleach-white cliffs, soaking in super hot rivers, marveling at spectacular waterfalls, chasing bears and catching my first fish ever. It was an epic trip. 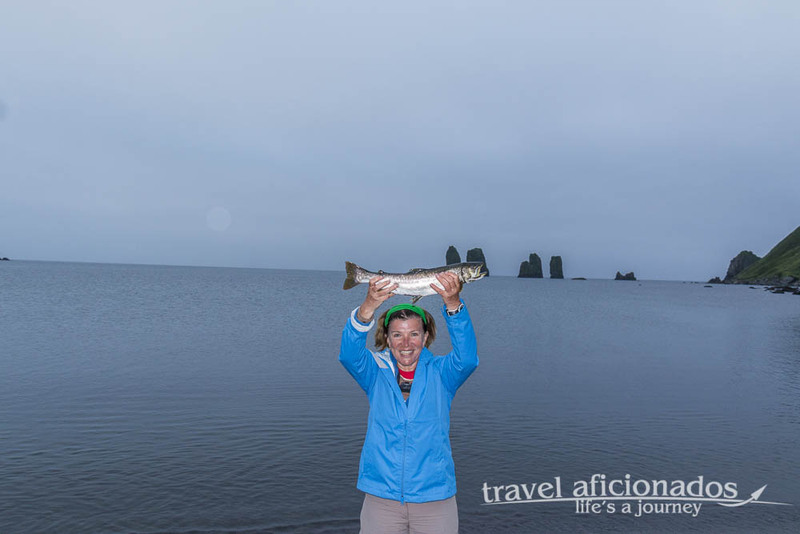 The story begins in 2016 when I met Seereen during a trip in Kamchatka. A native of London she is working for SHELL in Yuzhno-Sakhalinsk. We kept in touch and this is how I learned about a planed trip to Iturup with some of her friends. I had not heard the name Iturup before, this fact got me immediately interested. 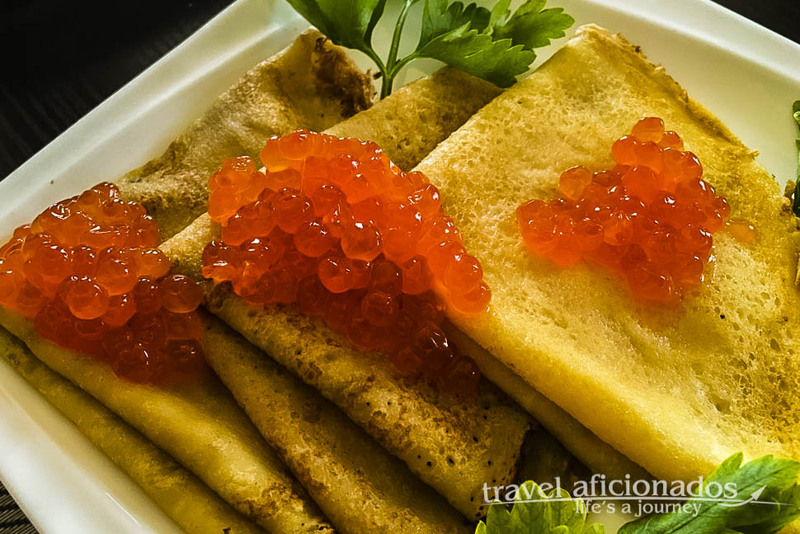 A quick google search revealed Itrurup as the largest island of the Kuriles, a chain of volcanic islands between Japan and Kamchatka. 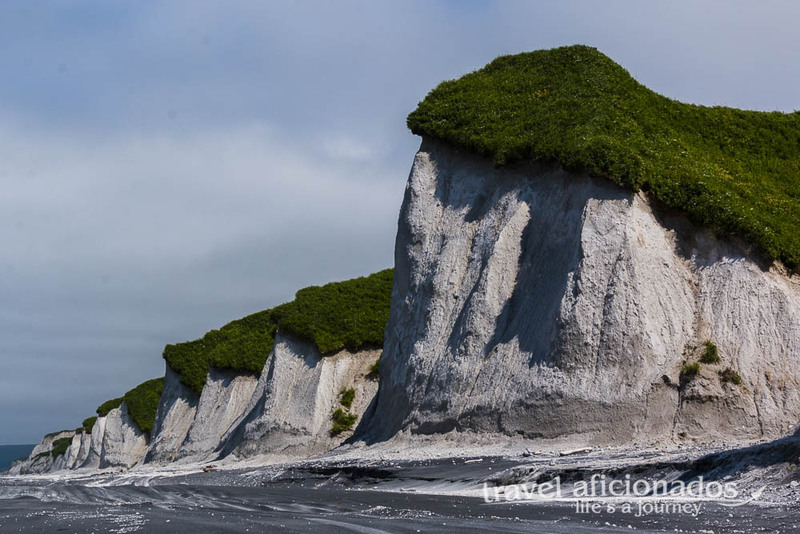 Cradled by the Sea of Okhotsk and the northern Pacific this 200km long island and neighboring Kunashir are is still claimed by Japan. This trip cannot be done without the expertise and help of locals, since anybody travelling to Iturup needs a special permit. 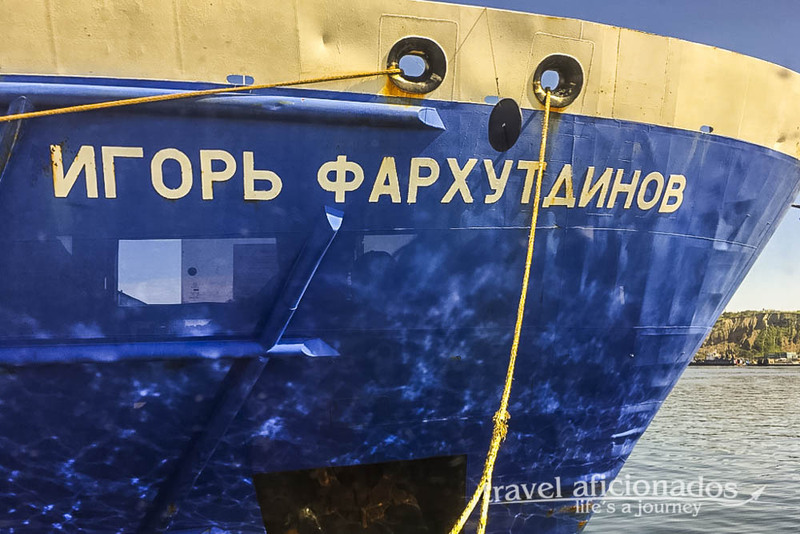 the island is under Russian control but claimed by Japan, for this reason flights and ferry tickets for Iturup can only be booked in Yuzhno-Sakhalisnk, not online or in any other place. 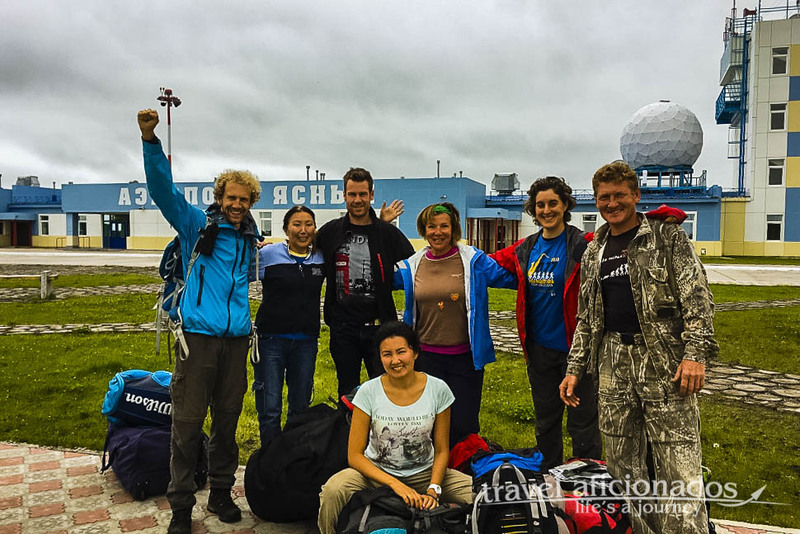 Eventually we were 6 people travelling together, 5 different nationalities: Chris, Joeri, Seerreen, Elena all work in Yuzhno, Valeria from Moscow and myself. 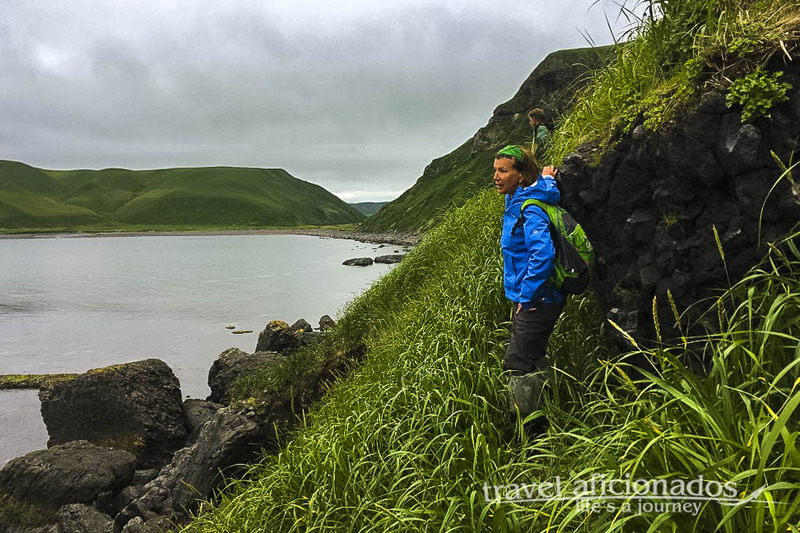 Elena had travelled to Iturup the previous year with her husband and loved it so much that she suggested this trip for her friends at Shell. 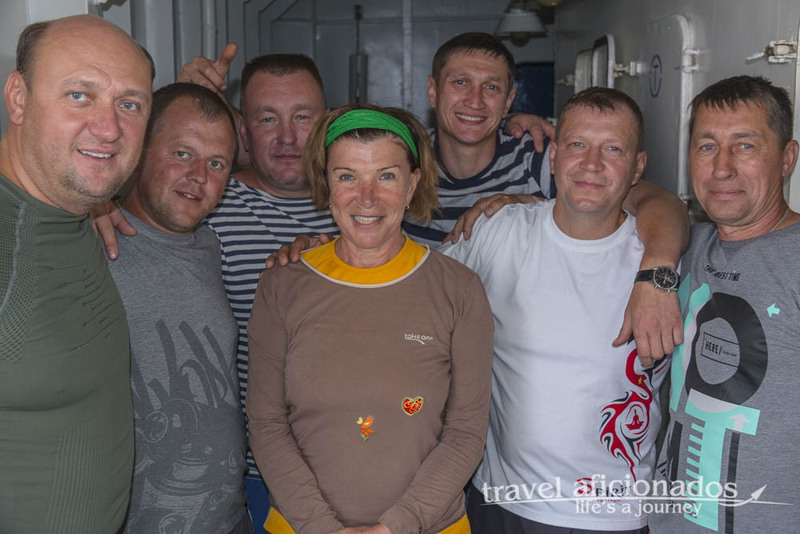 While Elena was the mastermind organizing the trip from Sakhalinsk, once on the island Juri, a pretty wild local, took over. The Igor Farkhutdinov took me safely to Iturup. It sails around the southern Kurile Islands in a loop, Iturup, Shikatan, Kunashir. The 18 hours journey turned out to be the most pleasant trip, none of my usual seasickness and lots of comfort. We left from Korsakov (30km from Yuzhno) around 3pm and I woke up when the foghorn blasted our arrival into the port of Kurilsk, engulfed in thick fog. The ferry was not my first choice, but could not get a flight. In the end it was the perfect decision, my friends arrived by plane with a horrible delay of 8 hours, nothing unusual because of the notorious fog that likes to linger over the island. Igor Farkhutdinov took me safely to Iturup. It sails around the southern Kurile Islands in a loop, Iturup, Shikatan, Kunashir. On the ferry I was the only non-Russian and drew quite some attention, soldiers going to Sukathan Island asked to have photos taken with me and the staff was more than helpful. 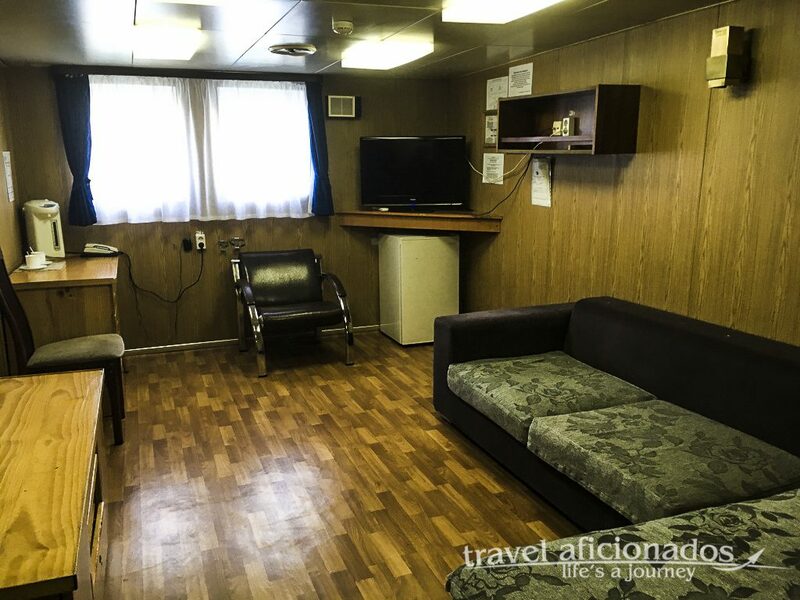 The women who shared the cabin with me was a psycho, which I managed to communicate to the staff through clear gestures and I was given my own cozy cabin. The restaurant and my room were so cozy I wish the trip had lasted longer. 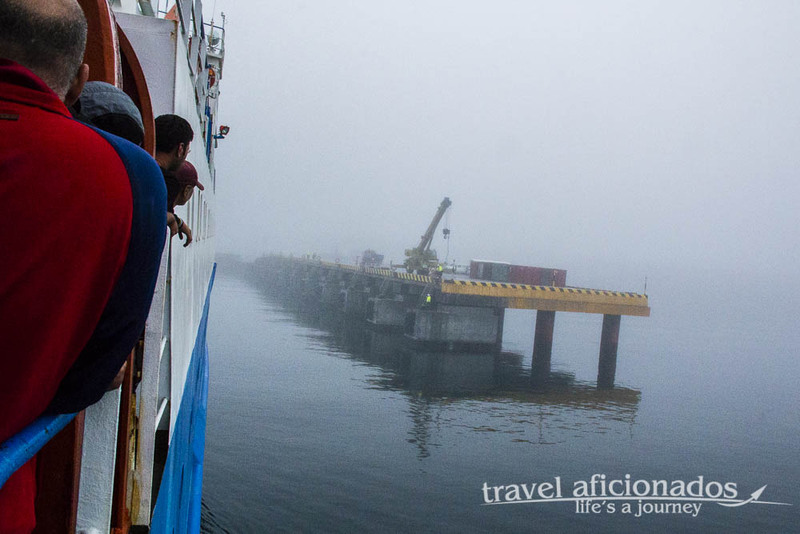 The foghorn woke my up when the ferry pulled into the small port of Kurilsk, the capital of Itrurup, engulfed with thick fog. 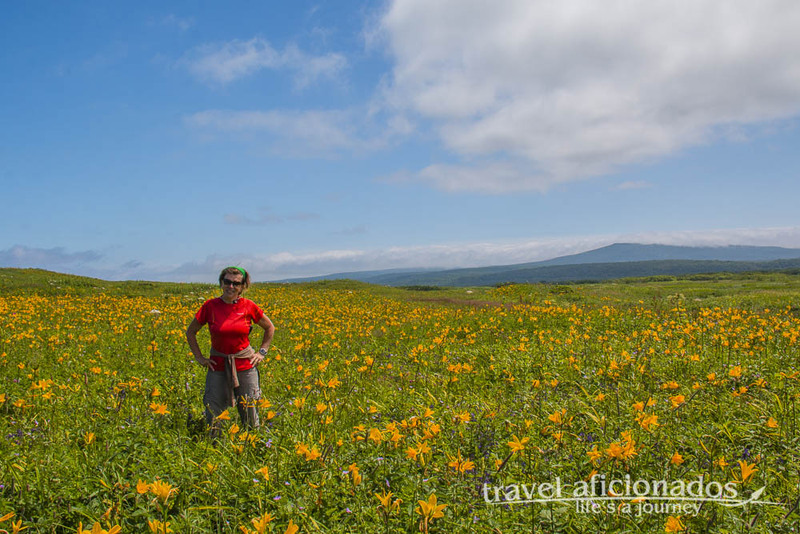 Russian tourists who come to this jewel among the southern Kuril Islands travelled with severe equipment, huge backpacks, fishing rods and tents. I never expected that his tiny capital would fascinate me so much. 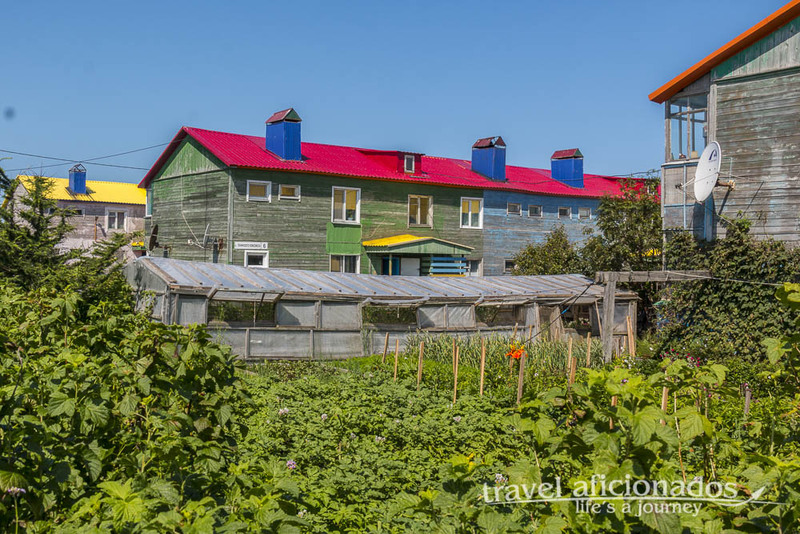 Since my friends arrived three days later, I spent days exploring Kurilsk which is best described as a melange of wooden houses with brightly coloured roofs surrounded by vegetable gardens and playgrounds. 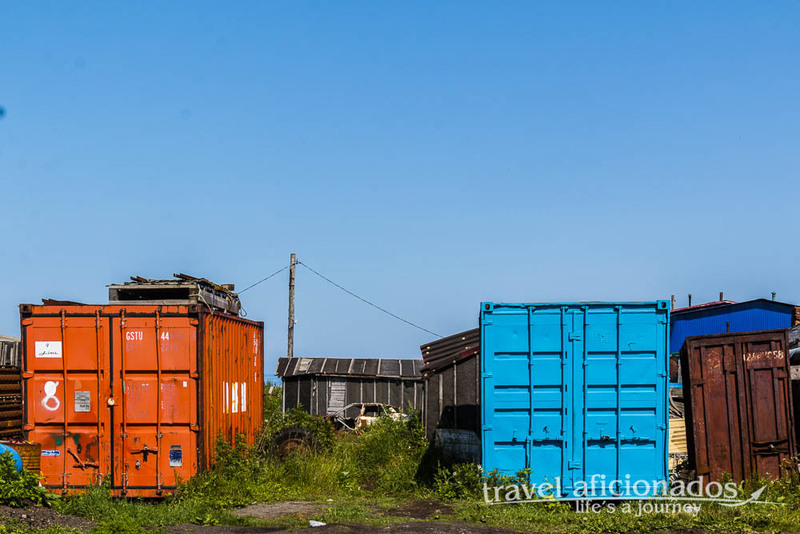 There seems to be great need for storage, lots of wooden sheds and rusty containers sit right on top of the cliffs overlooking the sea. Only the rusty car wrecks have no home and adorn the muddy trails. I also discovered two supermarkets, lots of small shops that sell ANYTHING you could possibly have forgotten to bring and my what turned into my favorite café. Why? The menu had photos and it and I knew what I was ordering. I took long walks on the long sandy beach that runs along the perfectly shaped bay where Russians lie in the sun, swim or fish. Signs instruct to run uphill after a tsunami warning, this is probably why most of the city is high up on the cliffs. 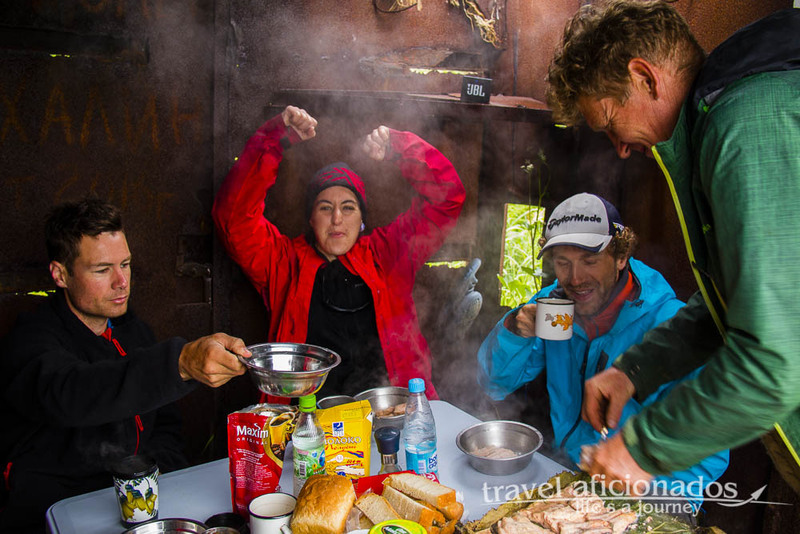 The three days I waited for the rest of the gang to arrive I stayed at Hotel Iturup at the edge of town (4500 Rubels/€65) since I did not want to stay at the dadscha of our guide Juri all by myself, in a wooden shack. 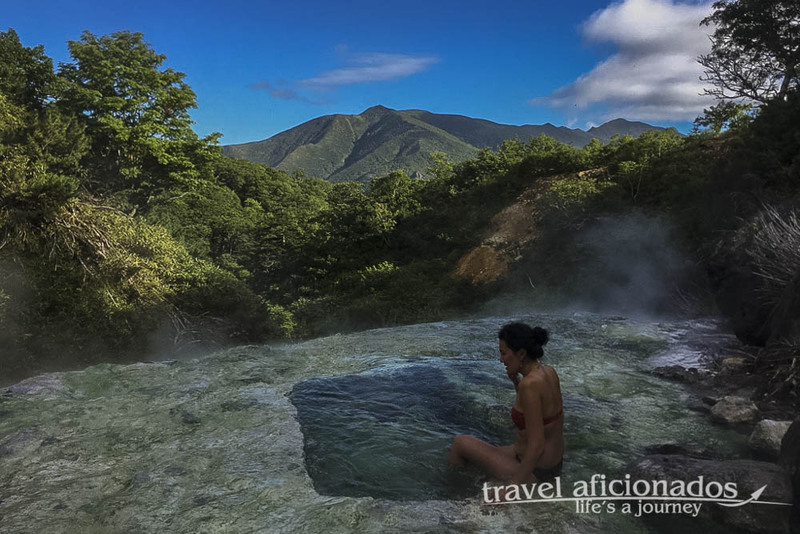 Iturup is full of hot springs, Vannocky is only a 30 minutes walk from the city center. For 400 Rubels you get to soak yourself in basins with hot water – inside or outside – overlooking the ocean. 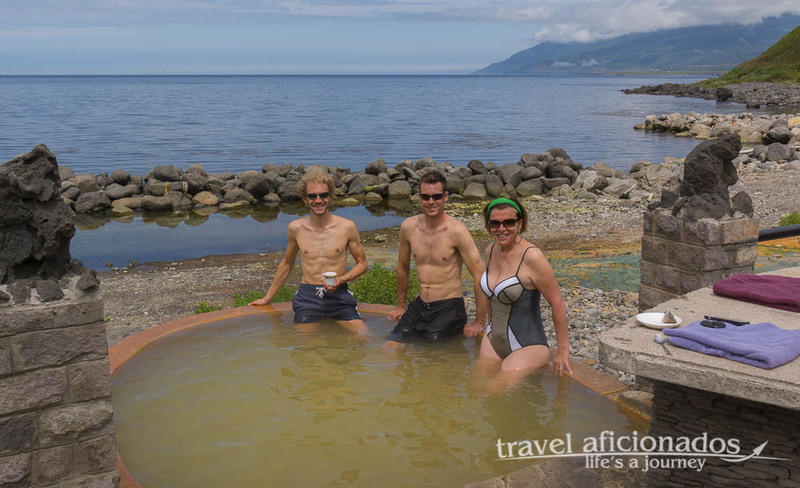 Iturup Island-hot pools at the foot of Baranskoga Volcano. Close to Kurilsk is a large lava field that covers a large part of the shore. 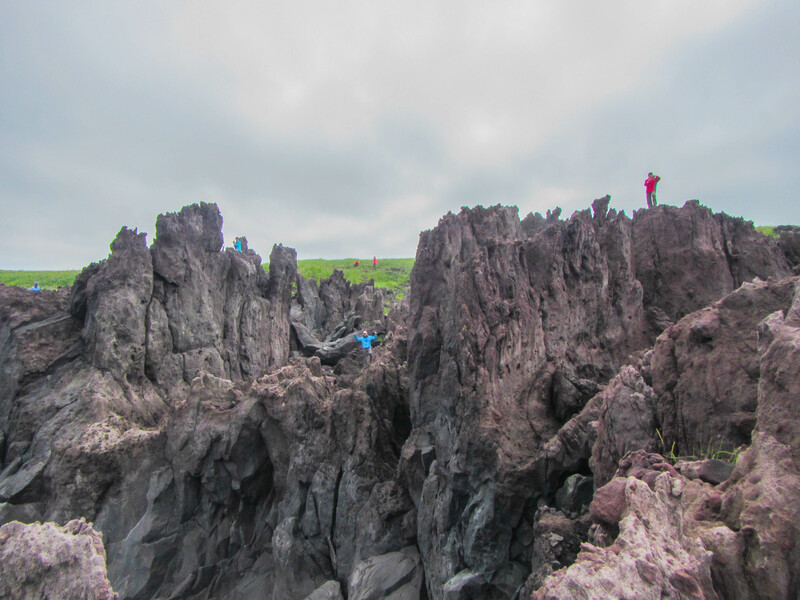 It is quite a scene – the reddish lava on top of large greyish stone. Green meadows full of colorful flower spread all along the cliff, from the distance it reminds of Irish coastline. 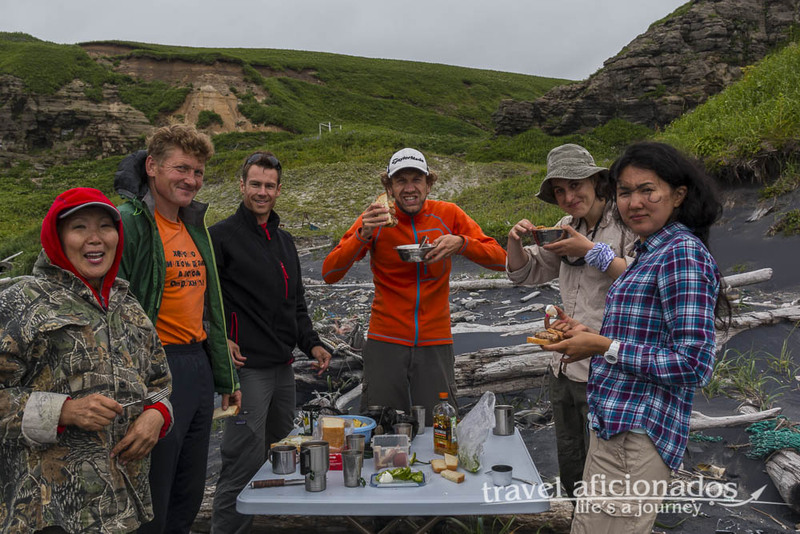 After three days of enjoying urban Iturup, the rest of our crew arrived from Skahalinsk and we all moved into the datscha of our guide Juri. Our first evening together in the dadscha set the pace for the entire trip. We celebrated Juir’s 30th birthday in style with vodka, a barbecue and a really birthday cake. 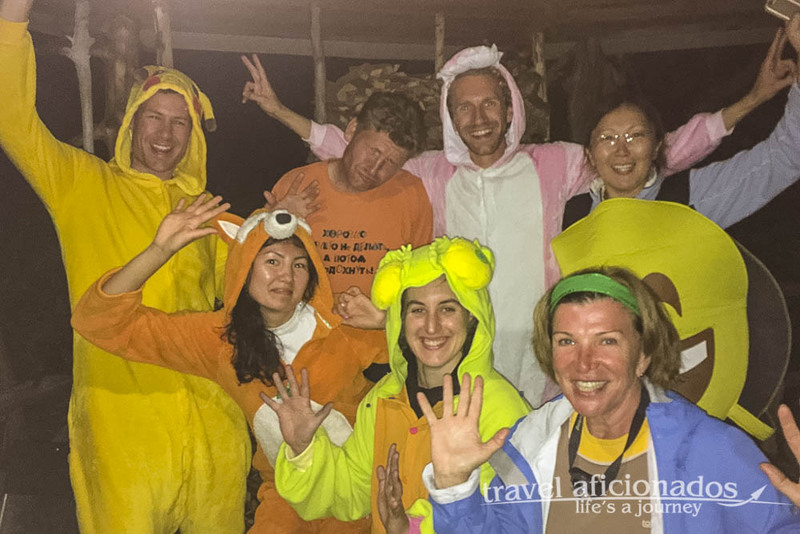 Everybody except me had brought an Onesies costum, a hilarious setting for a place so remote and pretty basic. And basic it was our new home. 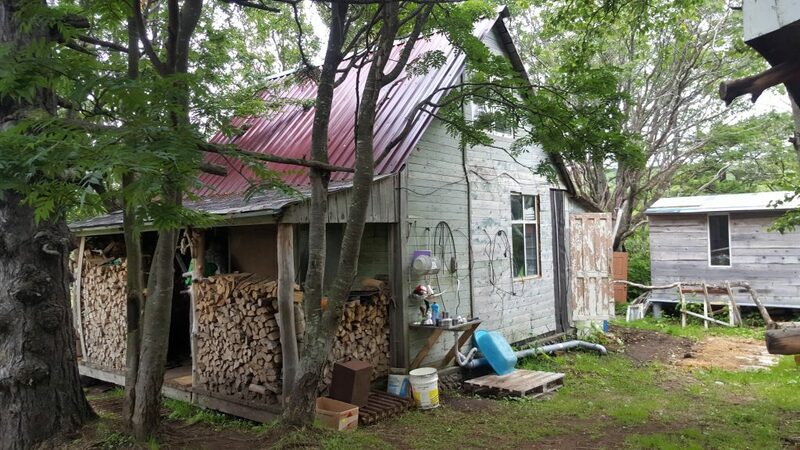 The four ladies slept in a tiny room in a wooden shed, the only furniture were two bank beds. 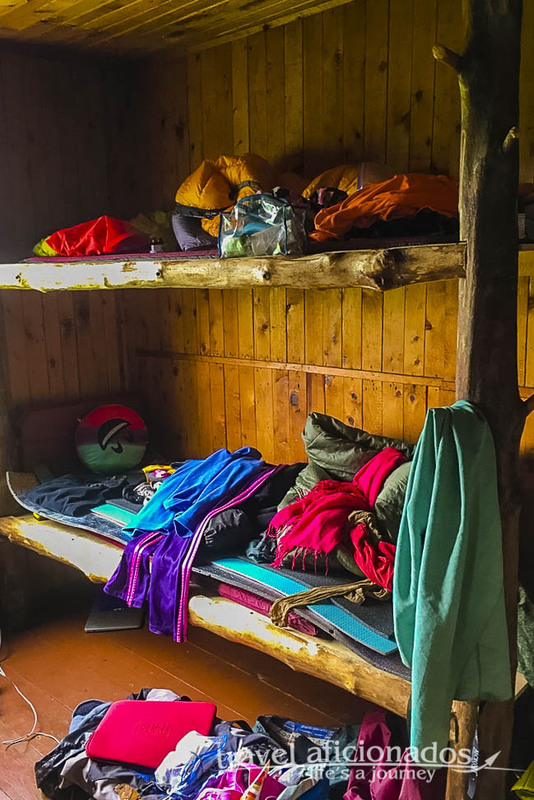 Chris and Joeri spread their sleeping bags on the floor in the attic above. The really luxury was an indoor toilet and a shower with hot water. 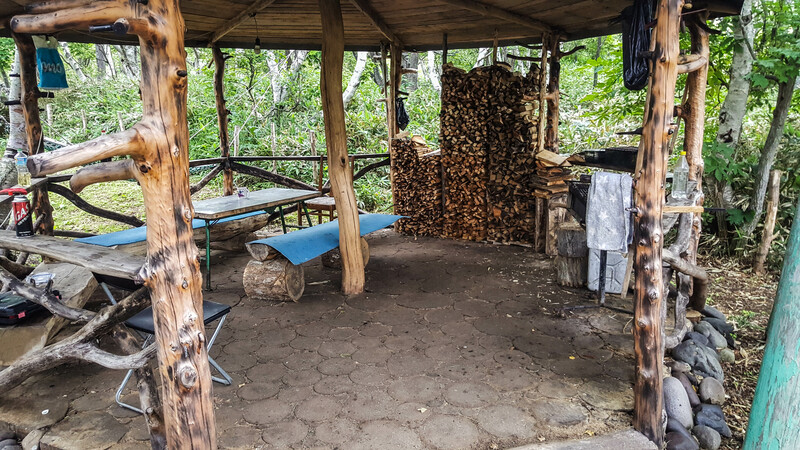 Our “livingroom” was a small area in the yard, a few wooden benches, a table and barbecue. A small roof protected us from the elements, the washing-up we did in a sink attached to an outdoor wall, with freezing cold water. It certainly prepared us for the wilderness we were going to experience. 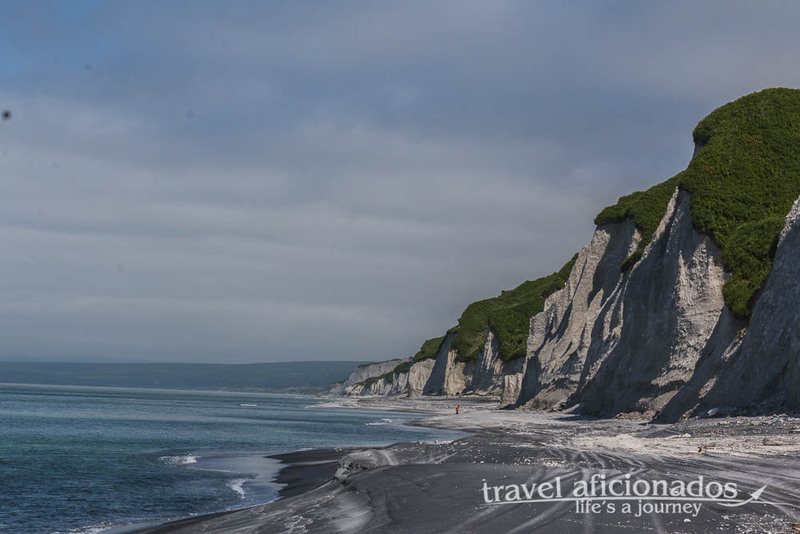 Our first excursion in Juri’s truck took us north to the spectacular the White Cliffs, bleach-white cliffs partly covered with thick green vegetation. With blue skies, white sand and an ocean glittering in all shades of blue we were at awe. Again and again we stopped to wade through oceans of bright yellow lilies dominated over bluebells, irises and other beautiful flowers I did not know. 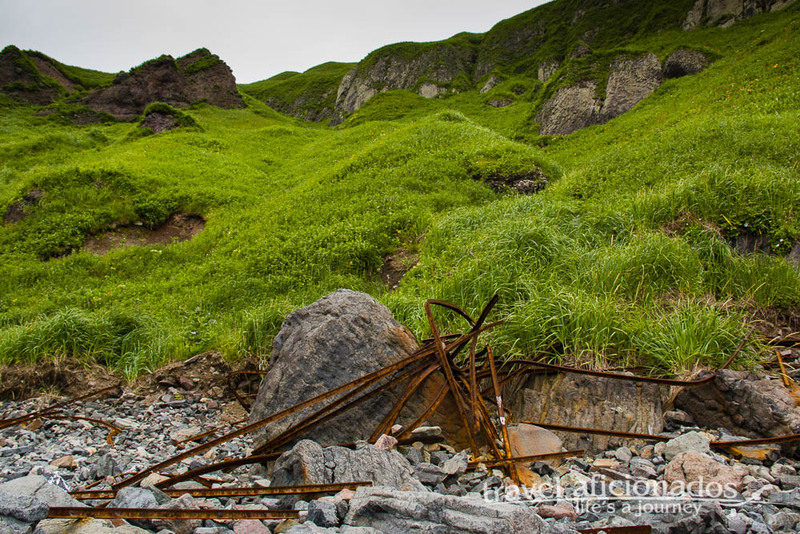 A filmmaker I met in Kamchatka in 2016 told me about the rusty tanks on the southern Kuril Islands and planted a seed: I wanted to see them with my own eyes. And we saw plenty. 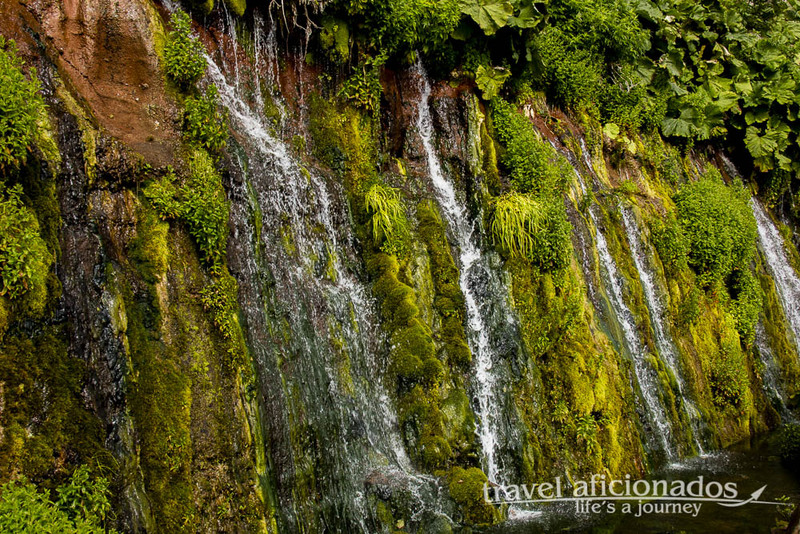 Once a bright green valley with a waterfall dropping down a vertical cliff hid behind the white dunes. This spot became one of two favorites places on Iturup. 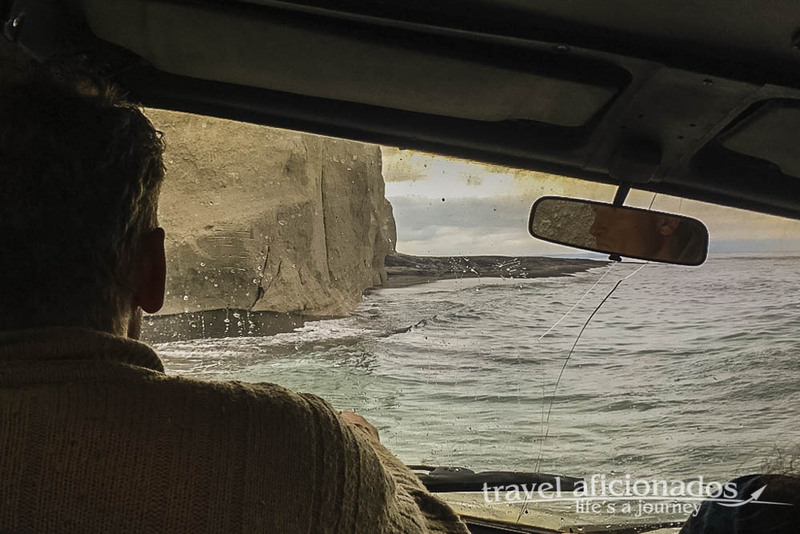 That far north roads do not exist, so Juri maneuvered his truck along the beach or on a small track on top of the cliffs. Once he hardly made it through the rough surf when the beach sloped off and the water reached almost to the doors . Pressed hard against the cliff we desperately looked for ways to escape, in case. Juri had to smoke a cigarette to calm his nerves once we were on safe grounds and we all shared of what we were thinking in those scary minutes. 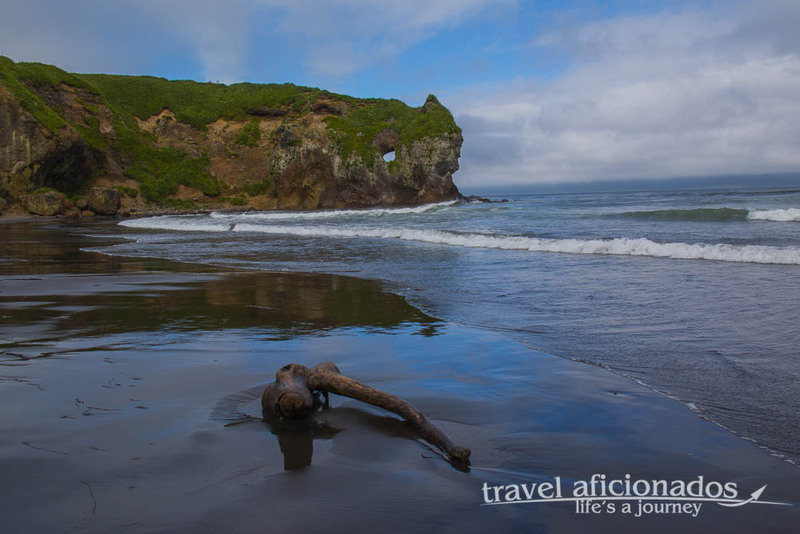 Iturup is all scenery and it is all around you. 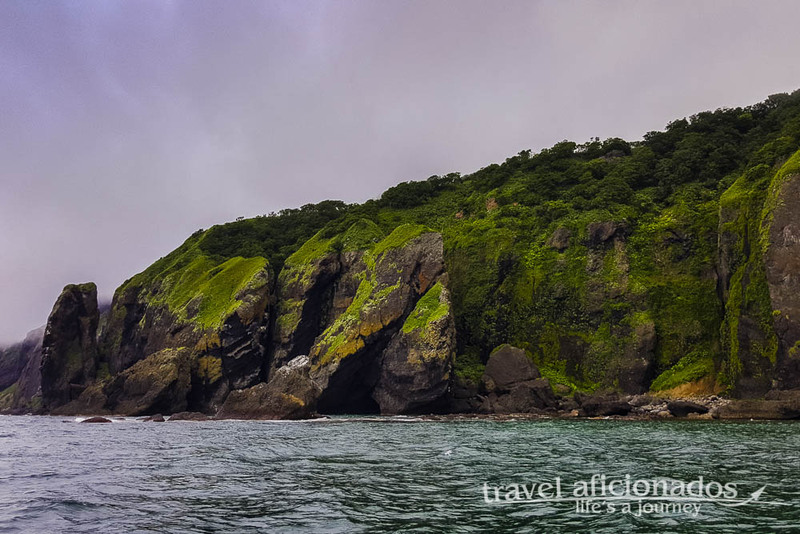 When we approached Parusnay Bay, the ocean and the steep cliffs were on one side, large green meadows dotted with wild flowers and lakes were on the other side. The bay is dominated by 5 pillars out in the ocean, the Five Brother. Juri noticed a young bear in the distance and blew his horn which annoyed us since we wanted to take photos, but Juri had a reason: we were going to camp here and so the bear had to be chased away. 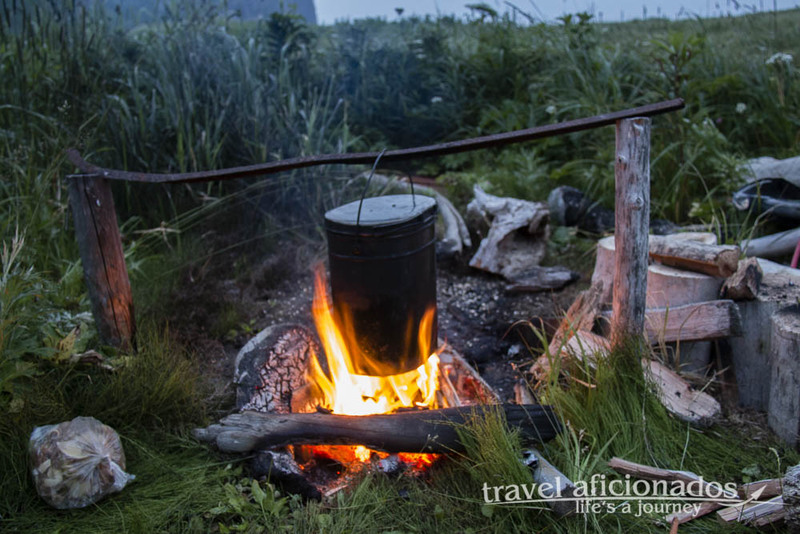 Within an hour we had caught six fish and Jiri made a delicious fish soup in the dark over a campfire. A tiny rusty container, probably left from WWII since its roof was full of holes, protected us from the drizzle that had set in. Luxury, when there is nothing else and when we let our headlamps dangle on a string above our heads it almost appeared cozy. Knowing we were in bears’ territory we discussed at great length what to do with the left over fish and were in for a surprise the next morning. I was the first to wake up only to find all the left over fish sitting right next to our tents, and yes, some of the fish had been eaten by an animal. I laughed hysterically, everybody except me had crawled into their tents equipped with bear flash and bear spray only to sleep next to a bear’s favorite meal. Only Juri was not impressed. After a hearty breakfast of steamed salmon he told us to put on our waist high waders since we were going for a walk. 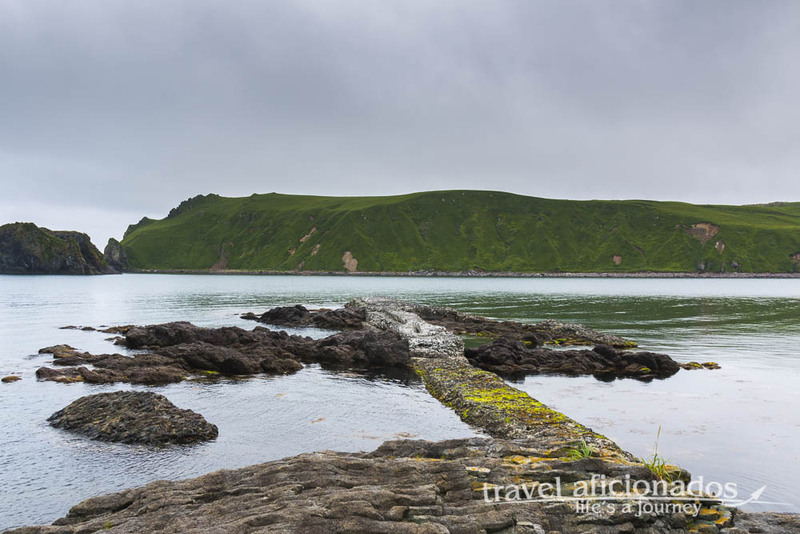 On our big rubber boots we stumbled along a beach covered with stones and rusty railway tracks. 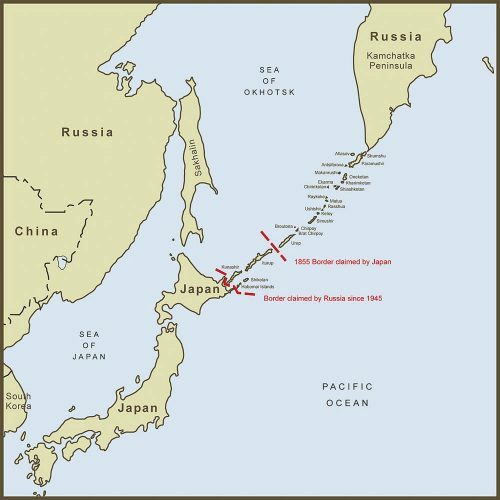 The latter were the remnants of a railroad built by the Japanese who occupied parts of the Kuril Islands (1905-1945) and constructed a all kinds of fortifications, roads (no overgrown with vegetation), a small runway for 8 planes stationed and a pier where the railroad started. 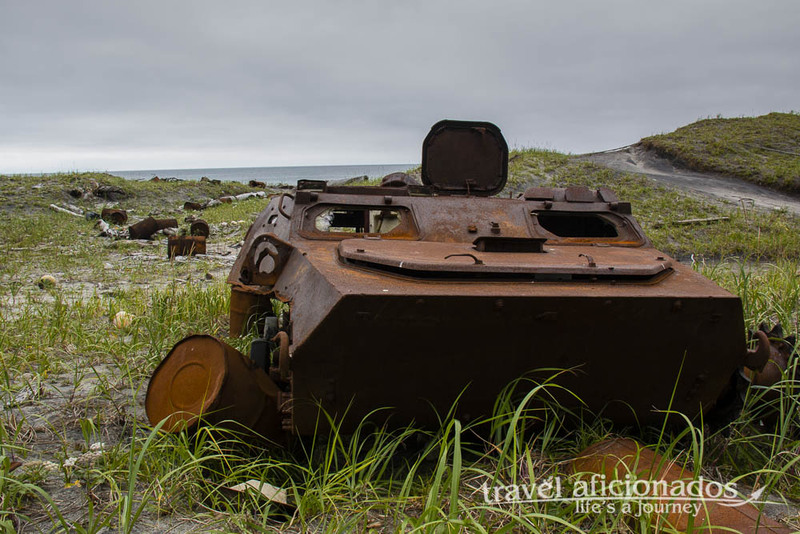 Being a frontier and a disputed one on top, made Iturup a strategic place: rusty tanks, deserted turrets and other military equipment from Soviet times can we seen all over the island. To reach the abandoned pier we had to climb up the steep cliffs in our waders, often our feet were only supported by the vegetation that clings to these rocks and I kept wandering why we had to do such a challenging hike in rubber boots and how I would get off the island with an open facture or seriously injured. With Iturup being one of the islands of the Kuril volcanic archipelago we were never far from geological activity, whether it was a volcano, bubbling mud pools, a boiling hot stream coming down a hill, deserted geothermal plants and the best of all these: the hot springs at the foot of Baranskoga Volcano. A hot river coming down the mountain feeds the natural pools and I soon found a favorite spot with my preferred temperature. This pleasure is free for everybody to use, but is it a good half an hour drive from Kurilsk, so only a handful of other people were there. Also at the foot of Baranskoga Volcano is a deserted geothermal plant with huge ancient, eroded pipes, hot white steam is gushing from one of them. We took videos of ourselves testing how long we could stay in the thick, hot and sulphur-smelling cloud. All around this terrain are bubbling mud pools and sizzling pools of water. 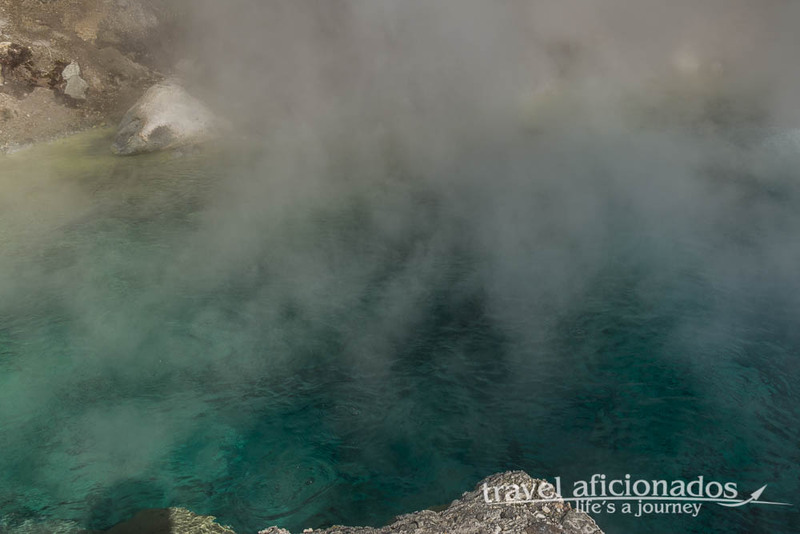 Another spectacular geothermal site is are Blue Eyes Lakes, a few small bluish pools full of steamy water that eventually flows down a valley filling the air with a trail of thick vapor, a breath-taking sight. 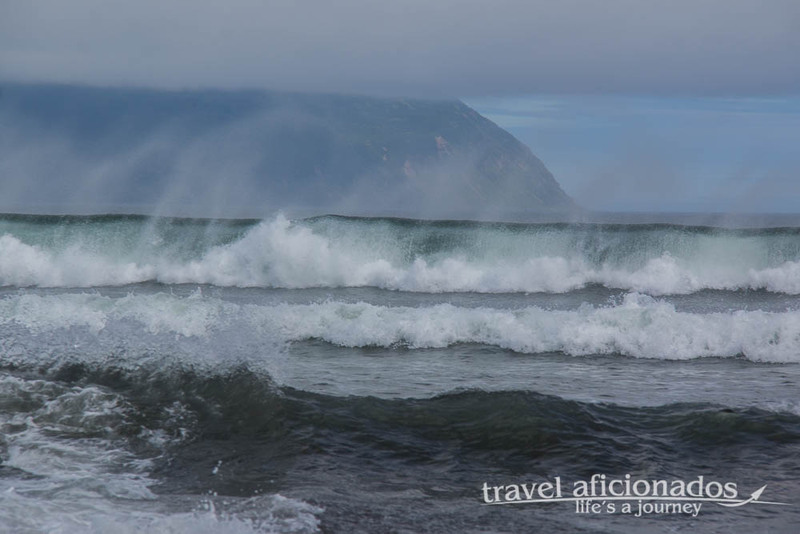 One day we crossed the island and ended up on a gorgeous bay on the Pacific Ocean, only spectacular surf and us. Wave after wave was rolling onto the shores, spraying a thin curtain of water high into air. I simply sat in the dunes covered with tick green vegetation and enjoyed the tranquility while the others were fishing our lunch. Behind a protruding rock we discovered a cave and lots of old cartridges left from wars long ago. I was forced to skip some serious walks my travel buddies mastered since my achilles ligament was hurting so much that I could only walk in sandals. 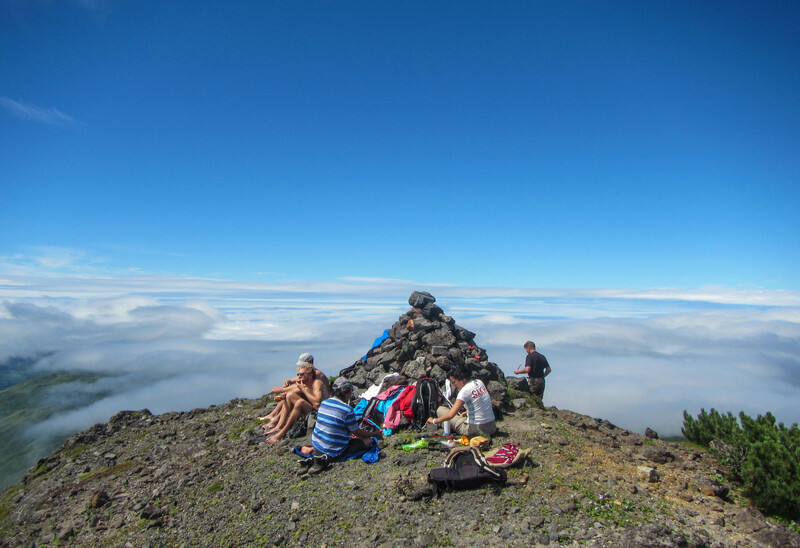 I missed the climb up Baranskoga Volcano and to the Limonite Cascade, half way up to Chirip Volcano. 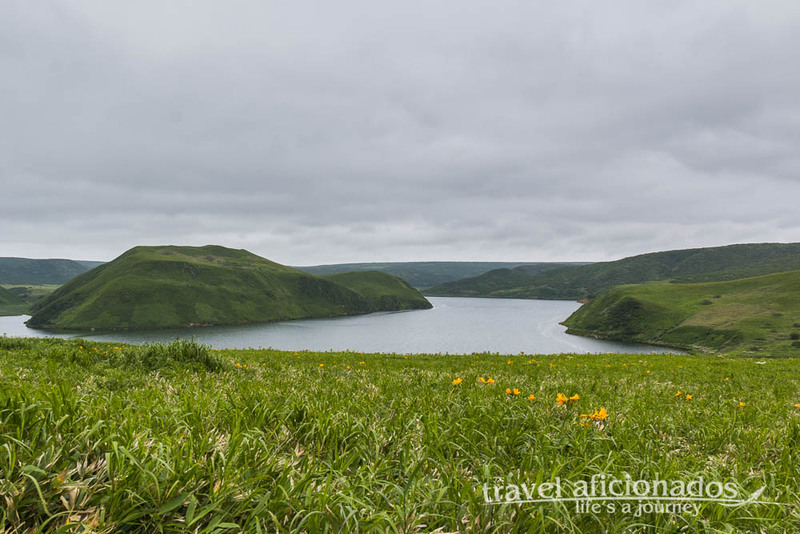 To reach the base of this trek you need to take a boat from Kurilsk for quite a while. None of these treks follows a path but you have to find your way and climb over rocks big and small, pull yourself up on bushes and plants. But the travel companions raved about it. While my friends hiked to the Limonite Cascade, a friend of Juri took me to the most stunning place, Stena Vodopadov, a string of small waterfalls gushing from a vertical rockface covered by moss. 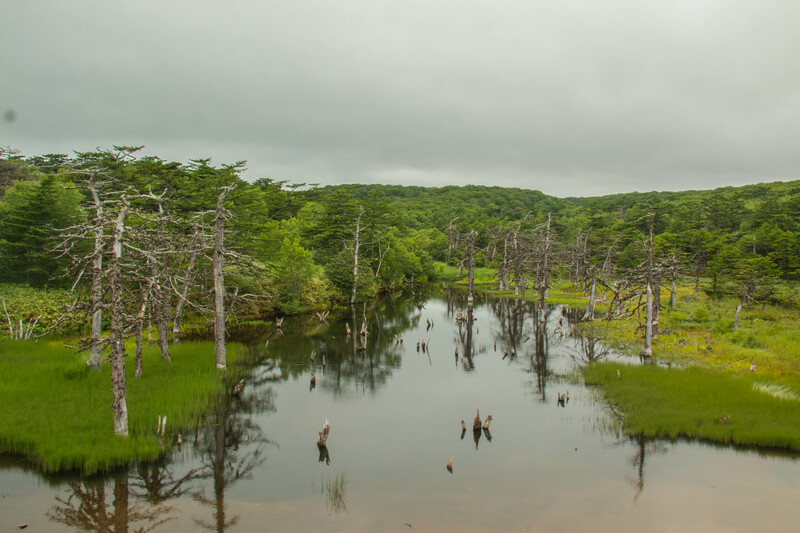 The bay below is equally stunning, on the way there we passed a mysterious sunken forest. Kurilsk has a few nice hotels. 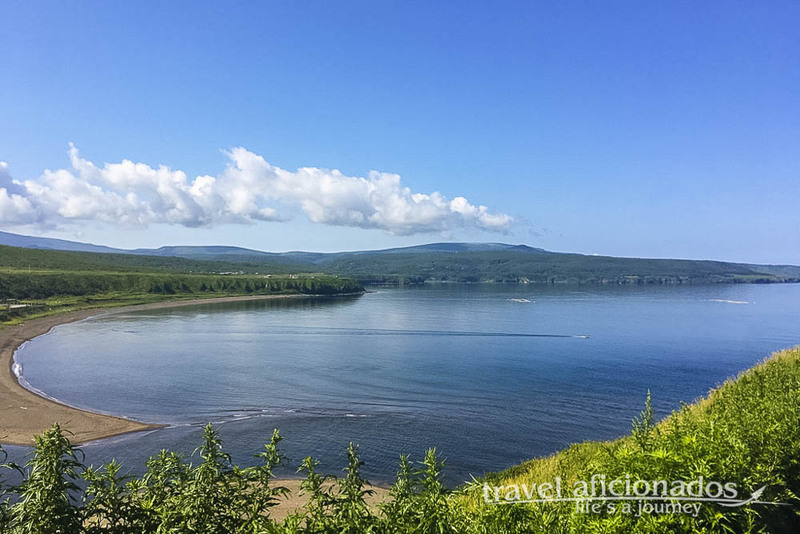 The first three days I stayed at Hotel Iturup at the edge of town (4500 Rubels/€65). I did not want to stay at the dadscha of our guide Juri all by myself, while he was climbing a volcano with Joeri and Chris. There is another hotel closer to town overlooking the scenic bay. From Iturup back to Yuzhno Sachkalinsk we traveled together and the unbelievable happened, no delay, no fog! An epic, adventurous and unforgettable trip that got me tempted to explore the neighboring island of Kunashir on another trip. The final moments of an epic trip.